No need to throw out the old TV or even replace the DVD players if you want to use your DLP projector. Learn how to hook them up to your projector through your AV source and watch TV in a cinema-set up. RCA: composite video (yellow) and stereo audio (white and red) plugs. Similar to headphone or video gaming plugs. HDMI: High-Definition Multimedia Interface connector integrating 19 cable pairs. This single-cable, all-digital solution is becoming the industry standard. Used with most HD devices. DVI: Most common digital video cables, similar to VGA connectors, with up to 24 pins. Supports analog as well as digital video so it most used with desktops and LCD monitors. It doesn’t do video so replace it with HDMI cables. VGA: Video Graphics Array connector has a 3-two, 15-pin connector and is used for video cards, computer monitors and HDTV. If your TV has any of these plug-ins, then you can hook up directly rather than using cable. You should visit our How to connect your DLP projector to a TV for step-by-step instructions. 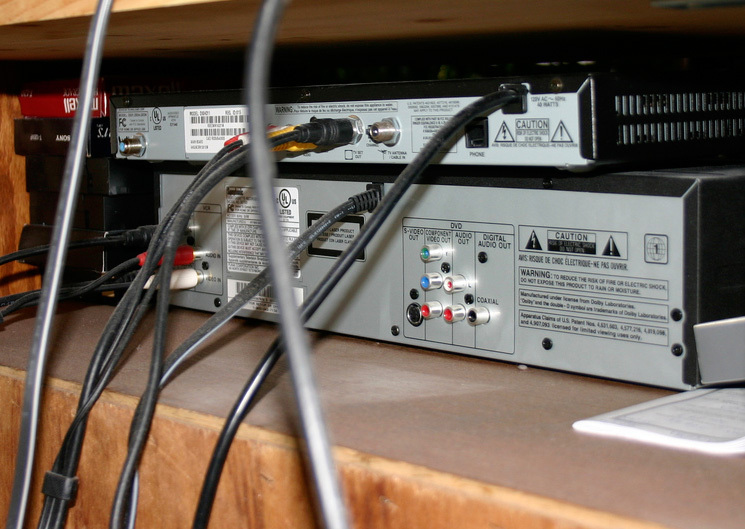 If your TV doesn’t have a outgoing video connection you will need to attach it to an AV source in order to convert the older broadcast signal into a useable video and audio signal. You can use either a DVD player, Blu-ray player, cable/satellite box or game console. 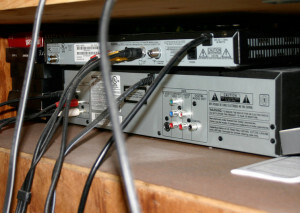 Most cable boxes are going to have either the RCA (composite), S-video (DIN connector), red/green/blue RCA jacks (component) or HDMI or DVI outputs. You’ll be connecting the TV to the cable box and then the cable box connected to the projector. 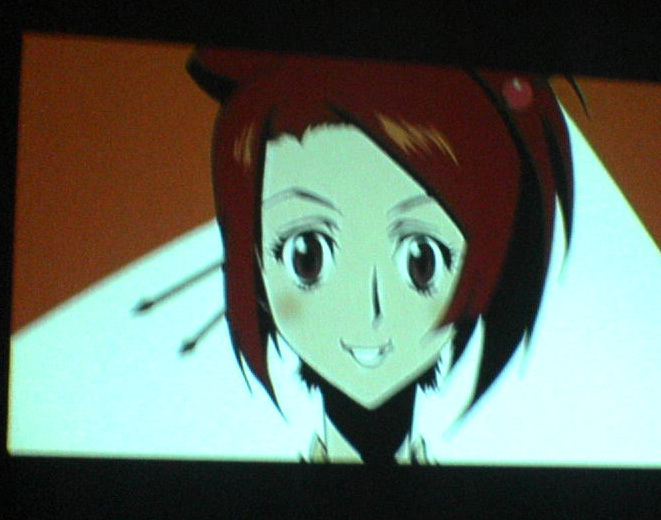 Use a coaxial cable (orange RCA cable) from the back of your TV into the cable box VIDEO IN jack. Connect a set of audio/video or S-Video cables from the VIDEO OUT of the cable box. A DVI component is preferable but you can use the RCA jacks. The red/white jacks would be connected to the AUDIO IN jack on the projector and the yellow RCA jack would go into VIDEO IN. If you are using the VCR/DVD as your source, it’s the same procedure but you will be using the RCA combo. Connect the TV to the DVD player. Then connect the VIDEO OUT and plug in the yellow jack, find to VIDEO OUT jacks and plug in the red/white jacks. Plug the other end into the projector. Go to the MENU or SETTINGS menu on the projector. Go to the INPUT SOURCE and change to the appropriate jack used. Some projectors have an SOURCE SEARCH button or function that will automatically find the video source. Remember that your projector will be reading what is on your TV screen. So if the TV screen in dark or blank so will be the projector. Since most projector don’t have high quality, you may want to use surround sound speakers. This is easy to do it you are using the RCA jack set-up. 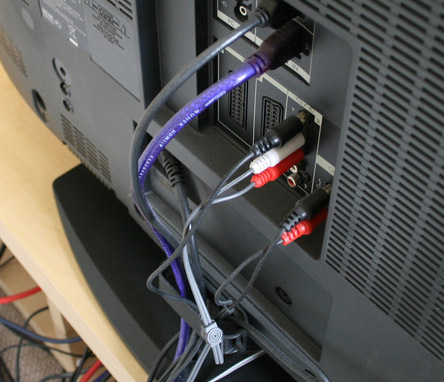 Simply unplug the RED and WHITE cables from the projector and plug them into the AUDIO IN slots on your sound source.